Details, details, details! This project is all about the details including juggling multiple text revisions for each section of the report, accuracy of financial tables, and lots of custom photo work. We use TeamWorkPM, an online project management platform, to manage the many rounds of revisions that make up this project. This project has always been fun. At kick-off the client provides the theme and topical essay that drive the cover design. Design staff read this essay and brainstorm ideas for multiple cover design options. We consider both illustrative and photographic solutions in this phase, and after discussions with the client, we winnow the concepts to three designs to develop for the design presentation. Our most memorable cover was a pink pig sitting on top of a stack of gold coins. We scoured the internet and thrift stores for the perfect porcine pal, eventually finding him on Etsy (the kind seller even hand painted him a different color pink). I have to say he was well-behaved during the photo shoot! After presenting the three design directions (cover plus interior spread) the client chooses a direction, and we make revisions to this design based on client feedback. As this project moves into production, organization is our key to success. Rather than working with complete and final text for the entire document, the client provides each section of final text at different stages. Therefore, each individual section of the report goes through multiple rounds of revisions, at different times. We keep all communication and filesharing in TeamWorkPM so that we and the client know where each section of the report is in the production phase. 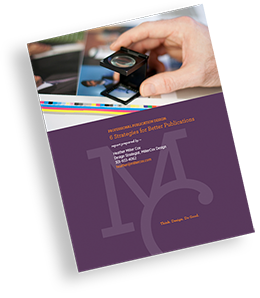 Imagery is a significant component of this particular annual report design. We do stock photography searches and incorporate client provided photos. All photos are cropped and re-touched, and are kept organized through TeamWorkPM. With all the photography and a finicky press, our many years of pre-press experience come into play. Color randoms are reviewed, and we work with the press staff to tweak the colors in the image. This entry was posted in Case Study and tagged Non-profit Annual Report Design. Bookmark the permalink.